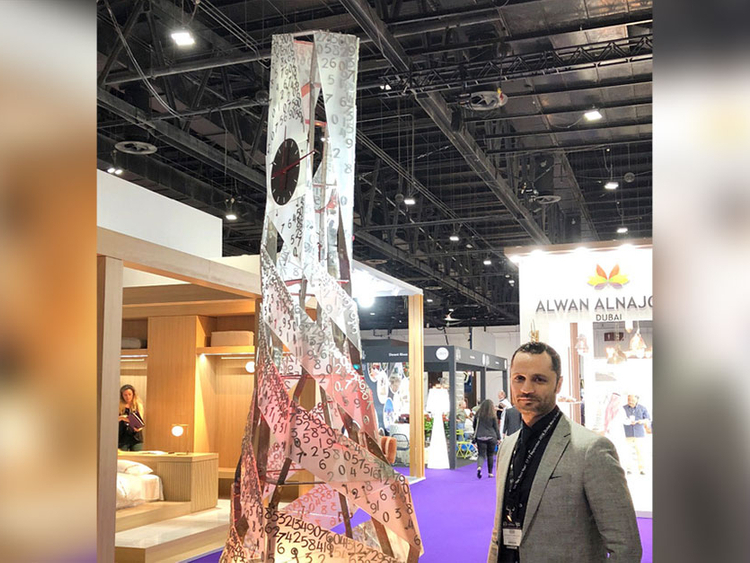 Dubai: The most awaited Dubai Clock was launched yesterday by Amjad Al Haj, an award-winning architect and a clock designer, at the nineteenth edition of The Hotel Show. The show is the region’s largest hospitality event that brings innovation and new ideas to the sector. “The name Dubai Clock has been derived as a symbol and a reminder of the city of Dubai. It has been stunningly designed as a piece of artistry and features a combination of magnificence and attraction,” a statement said. Amjad Al Haj launched the clock at The Hotel Show. The Dubai Clock which costs Dh700,000 is a beautiful amalgamation of numerical shapes carefully adorned with scattered numbers that are made of steel. The design of the clock is conical shaped, twisted and wide from the bottom and narrowing as it approaches the summit, to give it a luxurious look. Al Haj’s passion for time and architectural design inspired him to bring together this piece of art. The Tower has been built bearing in mind its purpose of creating a unique feel in the interiors or exteriors of a hotel property.